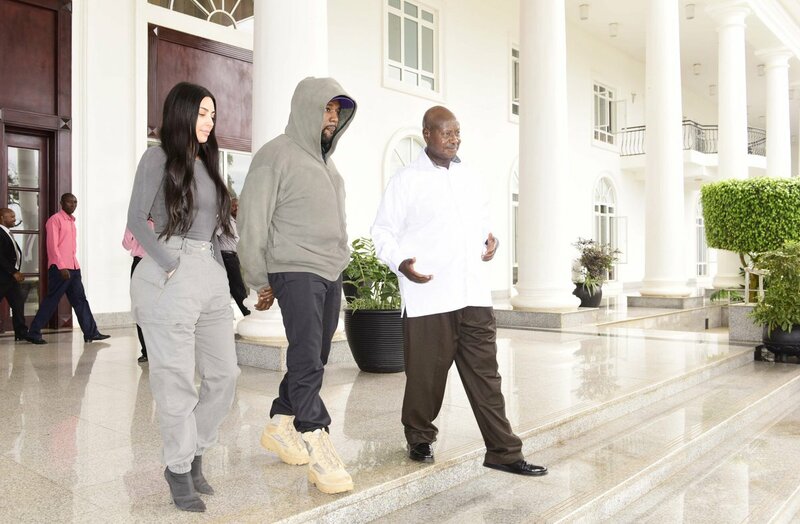 Kanye West and his wife, Kim Kardashian West, met with the President of Uganda, Yoweri K Museveni, during their trip to the country in East Africa. 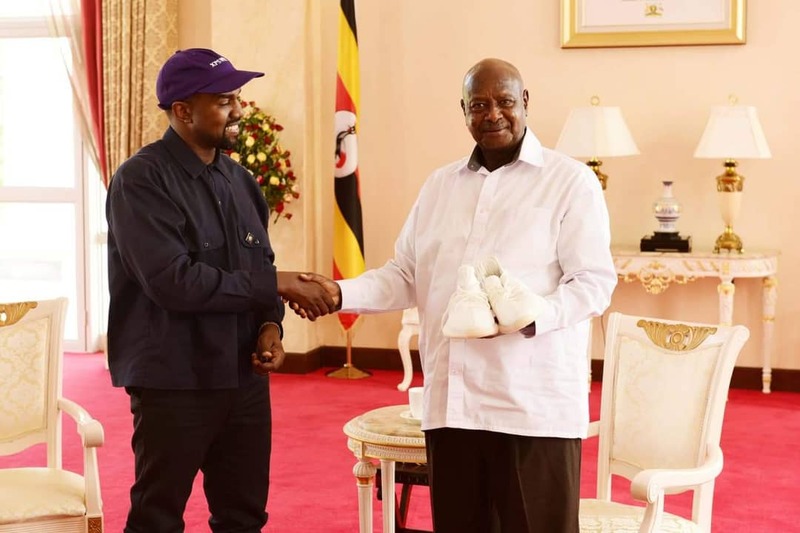 Museveni detailed the meeting with the power couple in a tweet on Monday, revealing that the 41-year-old rapper gifted him white sneakers amid talks of improving tourism. 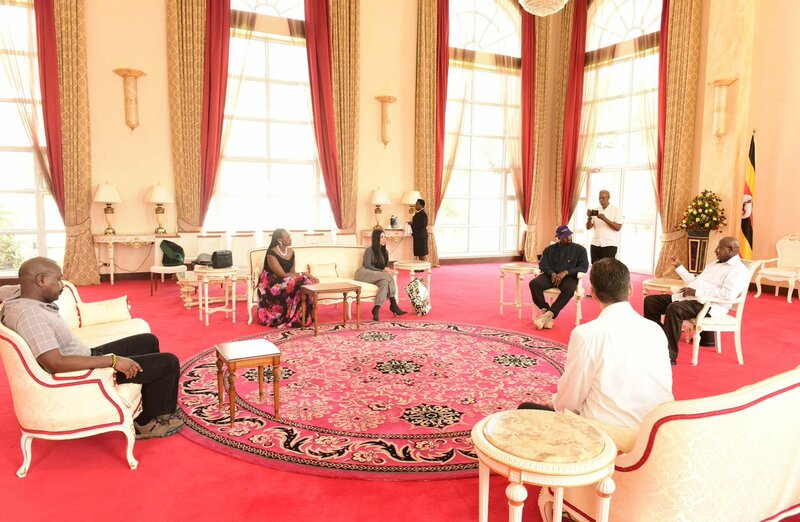 The president also shared photos from the meeting where he’s greeting the couple, posing with the sneakers and having discussions in an ornately decorated room. Atiku defeated other 13 other candidates including Senate President, Bukola Saraki and tSokoto state Governor, Aminu Tambuwal to emerge as Peoples Democratic Party (PDP) presidential candidate. The former Vice President of Nigeria, Atiku Abubakar will be challenging President Buhari for the office of Nigeria's presidency in Feburary 2019. The Congolese doctor and Yazidi activist won for their work to eliminate the use of sexual violence as a weapon of war. The Nobel Peace Prize on Friday was awarded to a Congolese doctor and a Yazidi former captive of the Islamic State group for their work to highlight and eliminate the use of sexual violence as a weapon of war. Denis Mukwege and Nadia Murad “have made a crucial contribution to focusing attention on, and combating, such war crimes,” the Norwegian Nobel Committee said in its announcement. “Denis Mukwege is the helper who has devoted his life to defending these victims. Nadia Murad is the witness who tells of the abuses perpetrated against herself and other.” The 2018 prize is worth 9 million Swedish kronor ($1.01 million). Last year’s Nobel Peace Prize winner was the International Campaign to Abolish Nuclear Weapons. Mukwege was the third of nine children born to a Pentecostal minister and his wife. He studied medicine because he wanted to heal the sick people for whom his father prayed, after seeing the complications of childbirth experienced by women in the Congo who had no access to specialist healthcare. Upon graduating from medical school in Burundi, Mukwege started working as a paediatrician in a rural Lemera Hospital near Bukavu, but seeing women patients who due to the absence of proper care often suffered pain and genital lesions after giving birth, he decided to travel to France to study gynaecology and obstetrics at the University of Angers. Nigeria's Senate President and the strong man of the senate, Bukola Saraki has officially declared his candidacy for the office of the president of Nigeria under the platform of the People’s Democratic Party (PDP). He continued: “Up and down our country today, Nigerians are crying out for succour. Many of our children are hungry. Many people are dying of avoidable or otherwise treatable diseases. Many have fallen below basic living standards, and are now among the 87 million that sealed Nigeria’s position as the country with the highest number of people in extreme poverty. Our young people lack opportunities. The necessary education facilities and system to equip them for the future simply do not exist. We are not creating the jobs needed to usefully engage them in order to grow our economy. And too often, the youth feel shut out, prevented from having any say in the direction of this nation. The harsh conditions of extreme poverty faced by the people, fuels the state of insecurity all over the country. Hunger, lack of education and lack of opportunities push many Nigerians into criminal activities including terrorism." “Our economy is broken and is in need of urgent revival in order for Nigeria to grow. GDP growth rate has declined. Diversification remains an illusion. Unemployment is at an all-time high. Businesses are shutting down. “Jobs are being lost in record numbers, and the capital needed to jumpstart our economy is going elsewhere. “Nigeria is perhaps more divided now than ever before. We are increasingly divided along regional, religious and ethnic lines. Nigerians are also divided by class, a festering gulf between the ‘Haves’ and the ‘Have-Nots’. “The fault lines of this nation are widening to an alarming degree. We must do something fast, and we must be brave about it. “We must ensure the security of lives in Nigeria. As things stand now, no one is safe in this country. No one feels truly safe. We must restore the sanctity of the rule of law and strengthen democratic institutions in order to build a just, fair and equitable society for all. “We must rebuild the trust of our people in government. We need a new generation of leaders that are competent, with the capability to rise to the challenges of the 21st century. We must pull this country back together and rebuild, block by block, with dedication and commitment. “You will agree with me that this is an urgent task that requires the concerted efforts of each and every one of us. If we look around today, what do we see? What is the condition of our citizens? Where are we as a nation? How are we perceived locally and internationally? Why are we not making the expected progress? Why are we not growing? There is no time to waste. The time is now, to come together to stimulate growth in Nigeria, especially in the national economy. “The choice we face in the forthcoming election is either to keep things as they are, or make a radical departure from the old ways. To find a better way of doing things or keep repeating the mistakes of the past. To fix the problems or keep compounding them. “It is with all these in mind, and taking account of the challenges that I have outlined, that I have decided to answer the call of teeming youth who have asked me to run for President. “Accordingly, I hereby announce my intention to run for the office of President of the Federal Republic of Nigeria in the coming General Elections in 2019 on the platform of the People’s Democratic Party (PDP). “I do so with the firm conviction that I have what it takes to secure inclusive growth for Nigeria and Nigerians. My Plan for Nigeria has inclusion in all aspects of the country’s affairs as a central pillar. Every citizen has the inalienable right to feel a sense of belonging, no matter their background or creed, or what part of the country they come from. No matter who you voted for or what your convictions are, government must work for you. “Your generation does not deserve to live in the poverty capital of the world. It is no longer an issue of how we got here, but how do we get out of this situation? “I promise you that I will lead the fight and employ every God-given resource available to us in turning things around. I am determined to grow Nigeria out of poverty. We will stimulate the growth of Small and Medium Enterprises (SMEs) as one of the ways of energising the economy and to create wealth for our people, especially the youth. “I want to see the youth play major roles at all levels, not only in government but also in the private sector and indeed in every area of Nigerian life. This will be a government driven by youthful energy, innovation and a pioneering entrepreneurial spirit. “Nigerian youth will be given all the opportunities to realise their potential to the full within a national framework that guarantees inclusiveness. For youth who have ideas and capacity, we will make sure that there is funding for their ventures; and we shall build on the Made in Nigeria legislation as part of our job creation drive. “My plan is to secure Nigeria by redesigning our national security architecture, while adequately equipping our security agencies to fulfil their primary role of protecting lives and property. “I will address our infrastructural deficit through aggressive financing initiatives including mutually beneficial PPP arrangements, regular floating of bonds and other financial instruments, which will ensure stable, adequate and reliable funding to see to the completion of core projects especially road, rail and power. “My plan is to protect all Nigerians and defend their constitutional rights and freedoms. I will stand for and uphold at all times the principle of the rule of law, which is the bedrock of democratic governance. “Ours will not be a selective fight against corruption. The emphasis will be on strengthening institutions, with a particular focus on deterrence. We cannot afford to compromise our institutions with proxy wars against perceived political opponents. We see the fight against corruption as crucial to Nigeria’s economic development. “I offer leadership driven by empathy. Where leaders are responsive to the citizens. Where they know that government cares. We will not be indifferent or turn a blind eye to the real concerns of our people. Every single Nigerian life matters. “For me, the leadership we deserve is one that will be a source of pride to all Nigerians, one that will be respected and admired in Africa and around the world. It should be a leadership that can hold its own and stand tall anywhere in the world. That is the type of leadership I offer. “As a former two-term Governor and currently President of the Senate by the grace of God, I believe I possess a unique blend of executive and legislative experience to push for and implement reforms that will deliver real improvements in the daily lives of our people. I know what it takes to create jobs and grow the economy. I can make the tough decisions when it matters. I will spearhead a new agenda that can transform the lives of ordinary Nigerians in real terms. “Believe me when I say that it will not be business as usual. This will be a dynamic government of action that will pursue the growth of Nigeria with doggedness, determination and conviction. I will lead a result-driven administration. We shall set targets with clear timelines to ensure that anticipated deliverables are met. You can benchmark us and hold us accountable. In short, I assure you that I will deliver on all promises. What I envision is a new chapter in governance in this country. We will be driven by what is best for Nigerians. “I have deliberately chosen the opportunity of being here with you, my Number One constituency who I see as the future of our great country, to make my intention known. I believe the Nigerian youth are critical to rebuilding and growing the economy, and restoring our national pride. “I therefore ask you and all well-meaning Nigerians to join hands with me in this noble cause. "President Uhuru Kenyatta on Monday August 27 met US President Donald Trump at the White House in Washington DC and held talks on security and trade. Kenyan First Lady Margaret Kenyatta and her US counterpart, Melania Trump joined the two leaders in the historic talks." Regina Pacies Secondary School Onitsha, Anambra State representing Nigeria and Africa in USA at the World Technology innovation challenge took the first place and won the top technological competition honour. The girls team from Regina Pacies Secondary School Onitsha were represented by below named students :They were led by Uchenna Onwuamaegbu Ugwu and the Onitsha team upstaged representatives of USA, Spain, Turkey, Uzbekistan and China to clinch the gold medal. World tech innovation challenge competition was a global technological competition for seconday schools around the world at Silicon Valley, San Francisco USA. The girls team, Save-A-Soul, from Onitsha, Anambra State developed a mobile application called ‘FD Detector’ to tackle the problem of fake pharmaceutical products in the country. Teams of girls worldwide learn the necessary skills to become tech entrepreneurs and leaders while creating apps addressing social issues in their communities. Junior division winners, Team Save-A-Soul, hopes to help consumers identify and avoid the intake of fake drugs in Nigeria using its app, FD-Detector (Fake Drug Detector). According to Team Save-A-Soul, Nigeria has one of the largest markets for fake drugs. The girls plan to partner with the agency responsible for drug regulation in Nigeria, the National Agency for Food & Drug Administration and Control. "Leveraging technology to save lives is our utmost priority, that is why we have decided to maximize this opportunity to solve the incessant rate of death caused by fake drugs," said Team Save-A-Soul. Credits: Mazi Enuma, PRNewswire, Timileyin Omilana Guardian Nigeria. Osinbajo the country's vice president made the decision to fire the intelligence chief due to the Tuesday morning blockade of the country’s legislature – the National Assembly, NASS. Osinbajo acted on the capacity as the acting president as Nigerian President Buhari is on vacation in Britain. The tweet by the Osinbajo’s personal assistant confirmed the discharge of Lawal Musa Daura and the directive to the former boss of DSS to hand over to the most senior officer of the State Security Service till further notice. Acting President @ProfOsinbajo has directed the termination, with immediate effect, of the appointment of the Director General of the Department of State Services (DSS), Mr. Lawal Musa Daura. "The presidency in a statement said the obstruction of lawmakers was without its consent. The DSS is a security arm that is directly under the presidency. It is responsible for primary domestic intelligence and protection to top government officials. Armed and masked personnel from the DSS temporarily block the entrance of NASS at a point blocking lawmakers from accessing the premises. After the lawmakers were allowed in, other officials and the media remained barred from the premises. President Buhari handed over presidential duties to Osinbajo as he left Abuja to London for a 10-day vacation. "